When temperatures drop dangerously low many homes and buildings are at an increased risk of frozen pipes and valves. When water freezes (20 degrees F) this causes the water to expand; the expansion inside pipes then cause frozen pipes to burst! Prevent your pipes from freezing in the winter with BriskHeat heating cables! Self-Regulating Heating Cable provides pipe freeze protection when you need it the most; self-regulating heating cables are specifically designed for freeze protection and de-icing or thawing of metal or plastic pipes and valves and dangerously cold temperatures; down to negative 40 degrees Fahrenheit or negative 40 degrees Celsius. The rugged industrial grade construction allows heating cables to be a reliable freeze protection solution, even the most extreme cold temperatures. Electric heat tracing, heat tape or surface heating, or trace heating maintains and raises the temperature of pipes to prevent freezing. 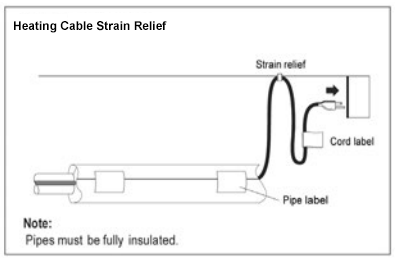 Otherwise known as Trace heating, using heating cable, utilizes an electrical heating element and wraps the length of pipes to deliver heat directly. BriskHeat's solutions are pre-assembled, easy to install, and plug-and-play! They are even automatically adjust the heat output based on the surface and ambient temperatures. If you are looking for heat tape for pipes, our self regulating heating cable is the ideal solution to prevent pipe freezing! 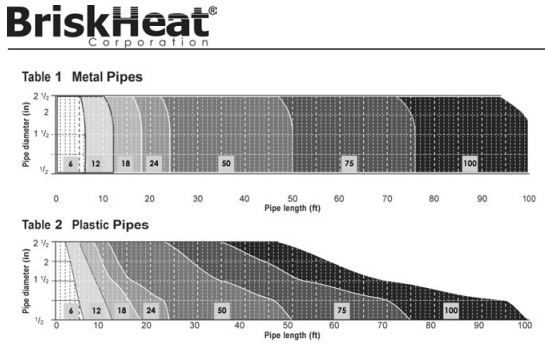 Add 1ft (30cm) to your pipe length for each valve or spigot on your pipe system. The charts assume the lowest outside temper-thick waterproof, fire-resistant thermal insulation. (preformed foam). For protection to -20°F (-29°C), use 1” (25mm) thick insulation. BriskHeat SpeedTrace Trace Heating Cables are suitable for indoor or outdoor use and are safe to overlap and insulate. 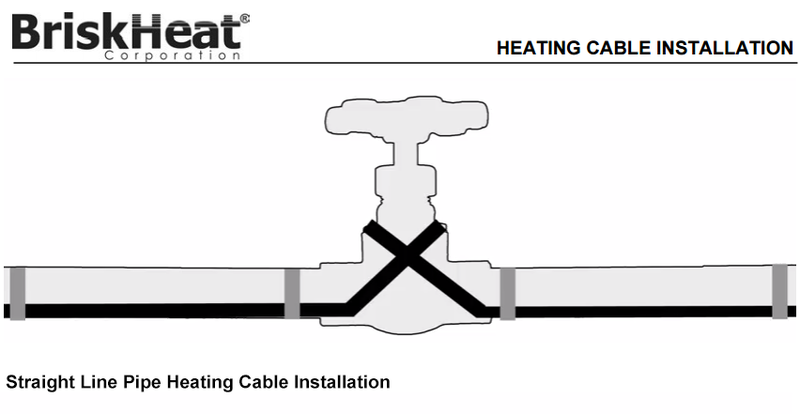 With BriskHeat Heating cables, there is no need for a temperature controller as our pipe heating cables automatically adjust the heat output based on surface and ambient temperature. 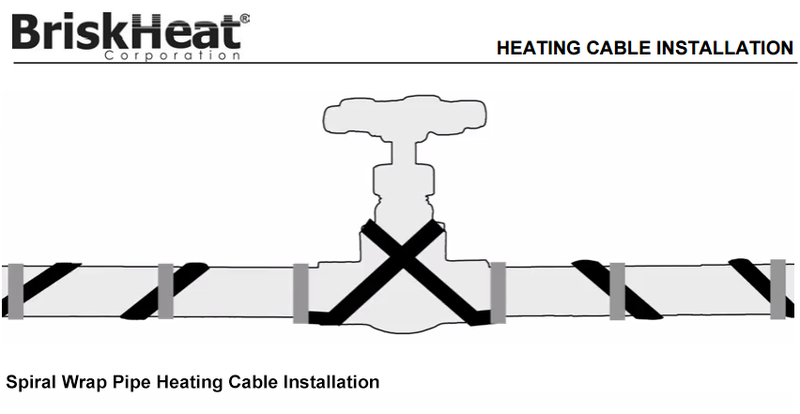 Simply run the heating cable along the bottom of the pipe, in a stright line, on a lower half of the pipe at either the four or eight o'clock position. Simply wrap the heat cable around the pipe; for the length of the pipe. Suspending a loop every 10 feet. To determine the loop length, divide the heating cable length by your pipe length and multiply by 10. Attach it to the pipe by circling the pipe with a piece of fiberglass adhesive tape at 1-foot intervals. Even out the distance between spirals by sliding the wraps along the pipe. There should not be any large air gaps between the cable and the pipe. If excess cable remains at the end of the pipe, double it back along the pipe. For protection to -20°F (-29°C), use 1” (25mm) thick insulation. Install the insulation on the piping as soon as possible to minimize the potential for mechanical damage after installation. Be sure the SpeedTrace heating cable label is visible on the outside of the thermal insulation. BriskHeat SpeedTrace Heating Cables are safe to insulate! Electrical tracing labels indicating the presence of electric pipe heating cable are included with the heating cable. Attach the supplied “Electrical Tracing” labels on the outer surface of the pipe insulation at an interval of one label for every 10 ft (3 m) of pipe to indicate the presence of the SpeedTrace heating cable. Plug the heating cable into a ground-fault protected outlet. Check the circuit breaker to verify power to the cable. Standing water in the pipe should feel warm within an hour. Install only in accessible locations; do not install behind walls or where the cable would be hidden. Do not run the heating cable through walls, ceilings, or floors. Connect only to ground-fault protected outlets that have been installed in accordance with all prevailing national and local codes and standards and are protected from rain and other water. 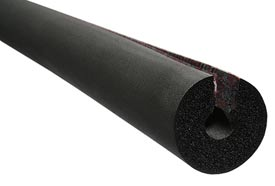 Install with a minimum of ½” fire-resistant, waterproof thermal insulation. Never use on any pipes that may exceed 150°F (65°C). Extension cord may not be used for permanent installations. For temporary installations consult local electrical and fire codes. Entire heating cable does not heat Verify heater is connected to proper voltage. Check to see if there is a resistance reading (not an open circuit) in heater using an ohm meter. Portion of heating cable does not heat Examine unheated cable for damage. Circuit breaker is tripping Validate that the circuit breaker is capable of handling the amp requirement of heater. Examine heater and cord for any damage.